Blank stares. That’s what we get when we tell people the area we’re looking at in Italy. 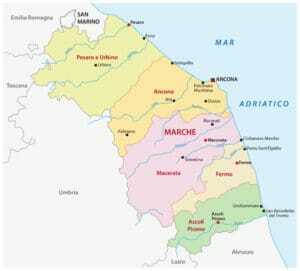 Essentially, no one has heard of Le Marche or really knows where it is. Even my online Italian teachers were hard-pressed to tell me anything about it. So, let me fill you in. The first three questions everyone has are, “Where is it?”, “Why does it have a strange name?” — in English, it’s often translated as The Marches — and, “Why not Tuscany?” Let’s deal with these. 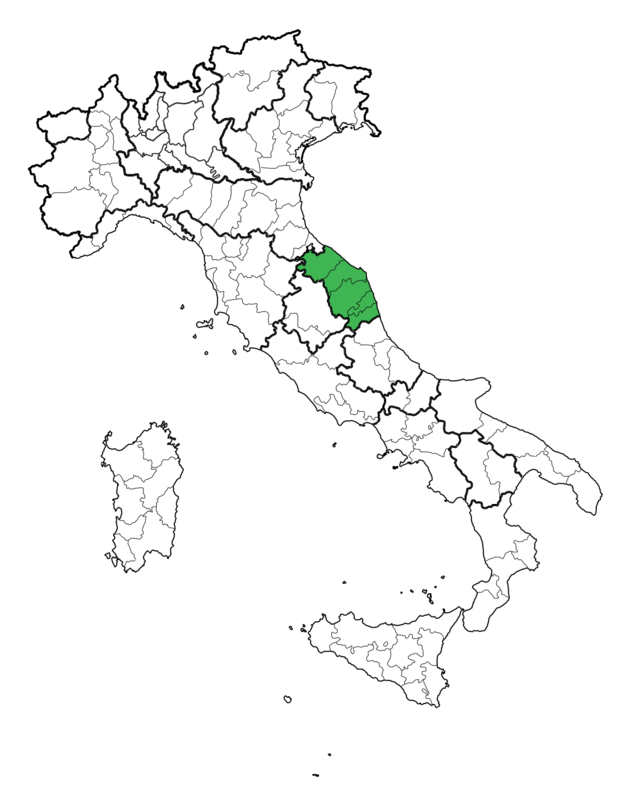 One of the 20 regions of Italy, it’s on the eastern side of the country, with a coastline on the Adriatic Sea and a western border along the top of the mountains that run down the center of the peninsula. North and south, it’s about in the middle. It’s northeast of Rome, about 3 1/2 hours by car, and southeast of Florence, again by 3 hours or so. The distances to these cities aren’t that big, but you have to cross the mountains to get to either. The terrain is mostly rolling hills, plus the mountains, with a small sliver of flat land along the coast. There are a number of river valleys that run down to the sea, so traveling east-west in the valleys is a lot faster than going north-south through the mountains and hills. It’s divided into 5 provinces, named after the biggest city in each. With one possible exception, you’ve never heard of any of these places. North to south, they are Pesaro & Urbino, Ancona, Macerata, Fermo, and Ascoli Piceno. The exception might be Urbino, not a big town but the birthplace of the painter Raphael. 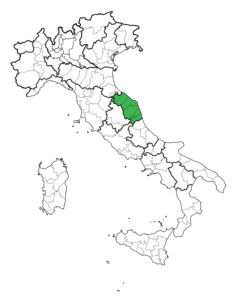 After my reconnaissance mission a year ago, we’ve decided to focus our search primarily on the Macerata province, in the farmlands around the towns of San Ginesio, Colmurano, Urbisaglia and Amandola. That will put us about 35-40 minutes from both mountains and sea. In the Middle Ages, most of Italy was ruled by the Pope, but on the eastern fringe were the Marches of Ancona, Fermo, and Camerino. These were nominally part of the Papal States, but were in fact under the control of local rulers, called a marchese, or marquis in English. Based on our extensive online searches and four days visiting about 15 houses, house prices, even on the far edges of Tuscany, are at least 30% higher than Le Marche. Look near Florence and, as they say, if you have to ask what it costs you can’t afford it. Now, I hope your blank stare has turned into a wise look of recognition.